Is it possible to make a selected card appear in a bottle inches from a spectator’s eyes? Find out by joining Eddy Ray and learn all of the secrets. 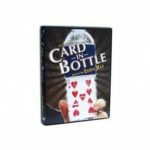 In this magic training course Eddy Ray will teach you a dozen visual effects, tricks and routines using an ordinary bottle. You’ll learn step-by-step with clear detailed teaching so that you’ll be able to add this incredible magic into your repertoire.